We’ll depart early this morning and drive to the mountain town of Silvia. Every Tuesday, the indigenous Guambiano people come to the town’s market to sell their produce. 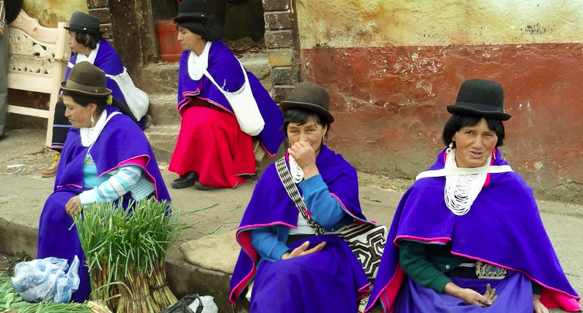 The Guambiano, one of the most traditional indigenous groups in the country, practice basic farming methods and still maintain their own language and traditional dress. Guambiano men and women dress similarly. Both wear hand-woven blue scarves or ponchos with pink fringe, and both wear bowler hats—the men’s are typically black, the women’s dark brown. We’ll continue on to Cali, the region’s capital city, for lunch at a local restaurant. Salsa music echoes through Cali’s streets, and after lunch we’ll enjoy a dance class and show before continuing on to the heart of the country’s so-called eje cafetero, or “coffee axis”—the best coffee-growing region of Colombia, if not the world. This beautiful landscape is dotted with coffee farms and poncho-clad coffee workers. We’ll arrive in the late afternoon at the newly opened Hotel Boutique Casa San Carlos. We’ll have dinner at La Trattoria restaurant.